Al Capone, in case you have been living under a rock, was an Italian-American gangster who led a Prohibition-era crime syndicate which included bootlegging and meeting the insatiable American appetite for alcohol. During Prohibition between 1920 and 1933 the production of alcohol was illegal in the United States but this did not stop the Canadians from producing whisky. The business savvy Al Capone, in the pursuit of happiness some might say, smuggled this whisky across the border to quench the American thirst for booze. The American lawmakers did not appear to share an enthusiasm for (others) pursuing happiness and the government chased Al Capone until he was finally convicted of tax evasion. In this review, I compare two bottlings of Canadian Club: one bottled in 1982 and the other bottled 31 years later in 2013. This is an exciting opportunity to go back in time, to parallel taste Canadian Club from 1982 alongside Canadian Club from 2013 and determine if the whisky has changed in 31 years. 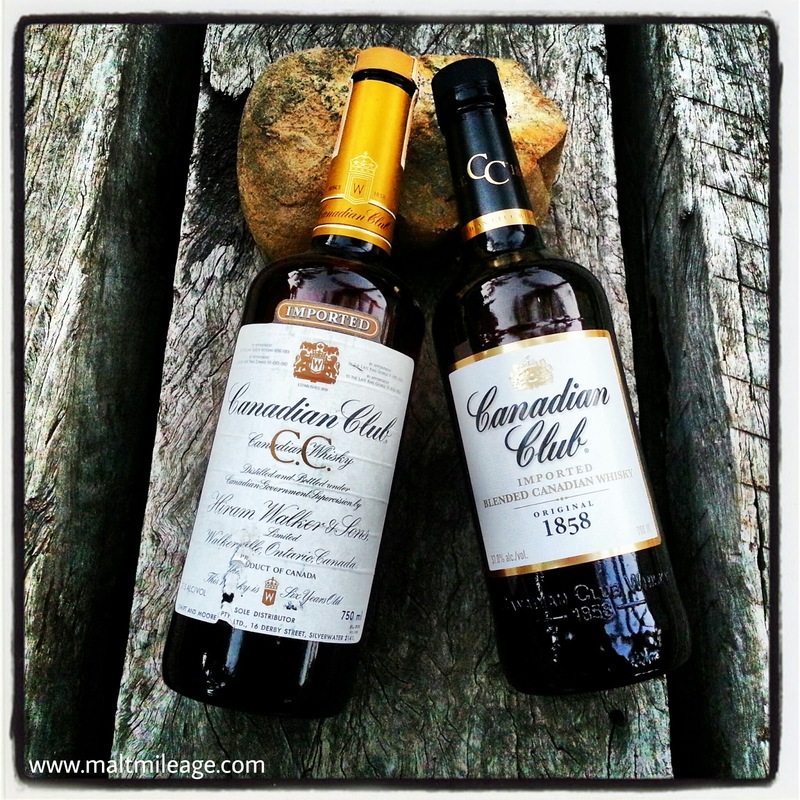 I found the Canadian Club bottled in 1982 had a dull nose but an interesting energetic character on the palate while the Canadian Club bottled in 2013 had a beautiful nose but a boring character on the palate. They two bottlings reflect an underlying sweet theme, but, much like my tasting of a vintage Johnnie WalkerRed Label and Jack Daniel’s Old No 7, current whisky making appears to have dropped off since the 1980’s and 1990’s. No wonder consumers are now demanding boutique whisky! Nose: Sweet candy shop sweetness lifts up from the glass, with cotton candy and bubble gum interlaced with the fine flecks of grain that sparkle within the creamy alcohol. Delightful, but not the most complex nose. It is also a tad flat as it struggles to command any real presence in the glass. Taste: Sweet… very sweet in fact! Tinned pineapple in syrup hits the palate with the candy shop theme, as the oak does very little while the alcohol shines with some bitterness and lemon. All credit to Canadian Club from 1982, this whisky was not meant to be anything special at its price but despite being an “entry level” whisky they clearly produced something very drinkable, smooth and enjoyable. It is not very complex, but that is to be expected. Finish: The character remains on the palate for a short while, as the fumes of alcohol evaporate off the tongue and full the mouth. Nose: This is much more lively and energetic than the 1982 bottling of Canadian Club, but it has retained its sweet candy shop themed heart with blackberry bubble gum and notes of vanilla emerging from a creamy foundation. As the whisky rests the candy shop theme develops into dried berries, in particular dark berries, as a gentle licorice theme develops in the form of anise seed. This is very impressive whisky, with a delightfully complex nose. This is a job very well done by Canadian Club, the nose has a big improvement from 1982! Taste: Flat, dull and boring unfortunately. It is very watery and diluted. While the nose has improved since 1982, the complexity on the palate has taken a steady nose dive to being quite bland and unexciting. It is very drinkable and enjoyable, and there are no noticeable undesirable notes: it is all smooth sailing without an iota of displeasure. There is not much pleasure, either. The creamy alcohol hits the palate with some spicy sweetness as the fumes lift from the tongue and linger with sugary sweetness. Finish: This whisky has a short lived finish that keels over and dies prematurely. Dull, boring and almost lifeless on the palate. However, some people enjoy a whisky that slips down without much character.